The Connected TV User Experience Report analyzes consumer attitudes towards devices that deliver apps to the TV including their sentiment on the device features, apps, channels, and in-app content that is important for a positive user experience. Coverage includes perspective from connected TV, video game console, Blu-ray Disc player, and streaming media player app users. The analysis focuses on the difference in reporting between current users and that from the next wave of adopters who expressed interest in a TV app experience. The Connected TV User Experience Report examines what consumers want from a TV app experience. The report quantifies the device features and content that is important to current device users and interested users. The data and analysis is used by content owners, digital media distributors, TV networks, retailers, and device manufacturers looking to develop and optimize their digital user experience. Further, TV Networks use these insights to optimize digital programming discovery and maximize viewership through these developing distribution channels. If you are working on app development, digital distribution efforts, digital content licensing deals, or building a connected device interface, this research provides the user attitude data and analysis needed to optimize your product and marketing roadmap. The report is delivered in Excel, providing customers a combination of interactive data tools, and quantitative analysis examining the drivers behind the various data points. The Connected TV User Experience report is the source for understanding what consumers want from devices that deliver apps to their TV. 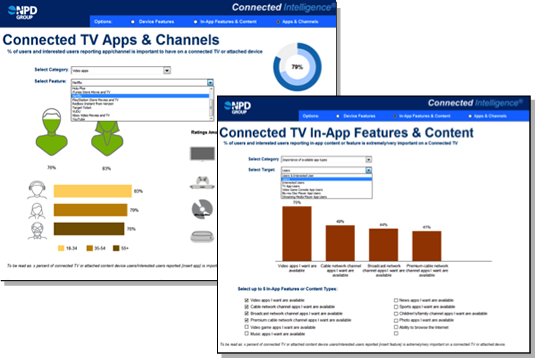 The panel-based reporting is from a sample of over 3,800 individuals across the population of U.S. Internet homes who provided their insight on devices that deliver apps to the TV. Understand the evolving connected world. Stay current on market conditions, technologies and more.